Joos an 11yr yrs old boerbull presented at Alphen with shortness of breath. Dr Russell Leadsom is a referral veterinarian with a certificate in cardiology who consults regularly at the Alphen Veterinary Hospital. 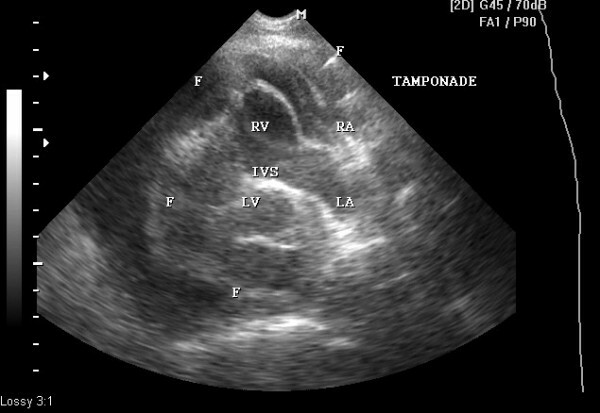 With his special skills and using our state of the art ultrasound machine he diagnosed a condition called Cardiac Tamponade. The heart is surrounded by a sack called the pericardium, which in the case of tamponade, becomes filled with fluid. This has the effect of not allowing the heart to fill with blood which must feel like someone standing on your chest! There are many reasons for this, some of them irreversible and sometimes the cause is unknown and medical intervention can save the dogs life. Dr Leadsom used the ultrasound to guide a needle into the pericardium and drained it. The effect was remarkable and Joos has had another 2 good years life after the procedure.